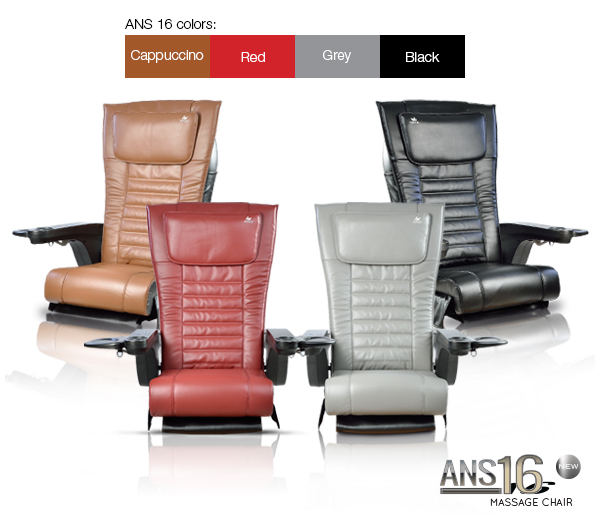 The ANS -16 is a modern and innovative massage chair that includes many special features and functions. Each ANS -16 comes equipped with an advanced massage mechanism that includes auto and manual programs for kneading, percussion and rolling massage. For extra comfort, the ANS -16 reclines from 90 to 130 degree angles, and moves back/forth up to 7 inches.. The ANS -16 also adds a touch modern functionality with 2GB of MP3 storage. Even more, the ANS 16 resists chemicals and acetone to give the chair a longer lifespan. Don't be the last salon to switch to the ANS 16. Upgrade your salon today. You will earn 625 Points for purchasing this product.